Grad Students' Tuition Waivers Will Remain Untaxed, After All A controversial provision that would have taxed grad students' tuition waivers was removed in the final version of the GOP tax bill. The measure, which was part of the House tax bill, drew protests. Graduate students rally against the proposed GOP tax reform bill at Union Square in New York City on Nov. 29. Now, the 145,000 grad students in the U.S. who receive a tuition reduction can turn their attention back to their studies. Tuition waivers will remain tax-free, according to the final version of the combined House-Senate tax bill released Friday. Republican leaders hope to pass the bill this week. Annual tuition for graduate degrees totals about $50,000 at universities like the Massachusetts Institute of Technology. Many graduate students avoid paying these sums by teaching courses or conducting research for their university in exchange for a tuition waiver. These students, many of whom are already struggling financially, would have had to pay tax on income that they had never seen if the provision made it to the final tax bill. Students spoke to NPR about how they made ends meet by skipping doctor's appointments, stitching clothes for their children, and living in unheated attics in cold Massachusetts winters. The proposed tax also raised the prospect of chilling admissions for higher studies in the future. Larry Lyon, vice provost and dean of Baylor University's graduate school, told NPR that it was "probably the most serious threat to doctoral education we have ever experienced." Even some Republican lawmakers who voted for the House tax bill signed a letter last week asking party leaders to remove the provision from the final version. 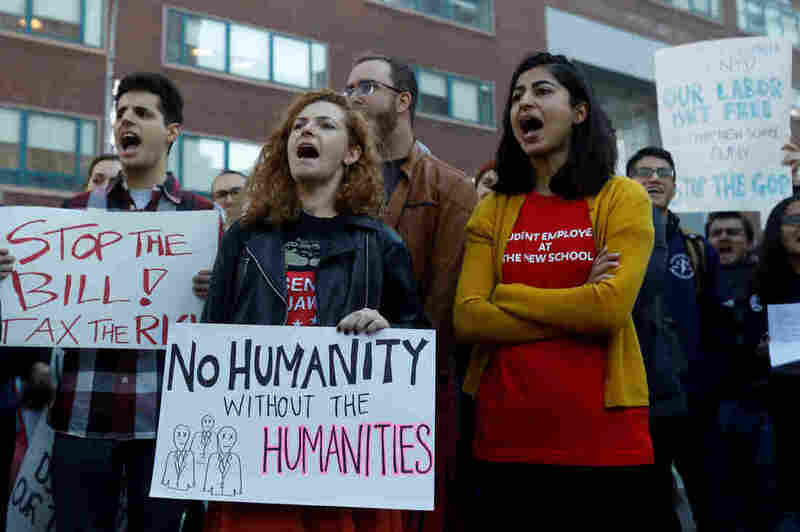 "Repeal of the income exclusion for graduate students would subject thousands of graduate students to a major tax increase at a time in their lives when they lack the ability to pay," the lawmakers wrote. Students reacted to the latest news with an exhale. "We're certainly relieved that the grad tax will not make it into the final bill," said Katie Park, a fifth-year communications Ph.D. student at the University of Maryland. "We hope the threat of this grad tax has shed some light on how bad the situation really is on campuses all over America," she said.